Tuesday, September 4: Read Stokstad, pp. 1-21. Review Web page entitled: Late Antiquity: The Imperial Image. Smarthistory Arch of Constantine page. 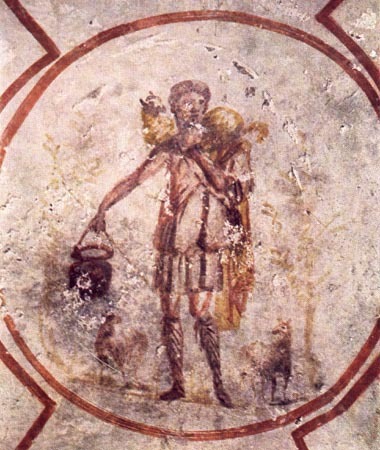 Also review the Web Page entitled: Early Christian Art. Note that this page is linked to a page entitled: Early Christian Texts. You can also review the page I wrote that is incorporated into the Smarthistory web site. At the same site, there is also a page I dedicated to the Santa Maria Antiqua Sarcophagus. Tuesday, September 18: we will examine the crucial period of the alliance of Christianity and the Roman Empire. With the patronage of Christianity by Constantine the Great, neither Christianity nor the Roman Empire would be the same. Review the webpages entitled The Post-Constantinian Conception of Christ and the Early Christian Basilica. A major document of Early Christianity and its transformation under imperial patronage is the Nicene Creed. Review Smarthistory page for the Junius Bassus Sarcophagus. Tuesday, September 25: we will be continuing are examination of Post-Constantinian Christian Art. We will be considering the nave mosaics of Santa Maria Maggiore. We will also be considering the interrelationship of Pagan and Christian Art. Good Shepherd from the Catacomb of Callixtus, mid third century. 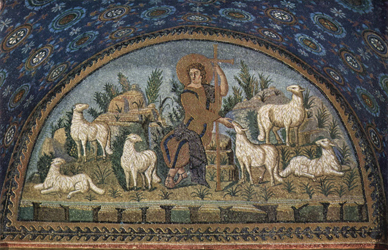 Good Shepherd mosaic from the Mausoleum of Galla Placidia in Ravenna, c. 425-450. 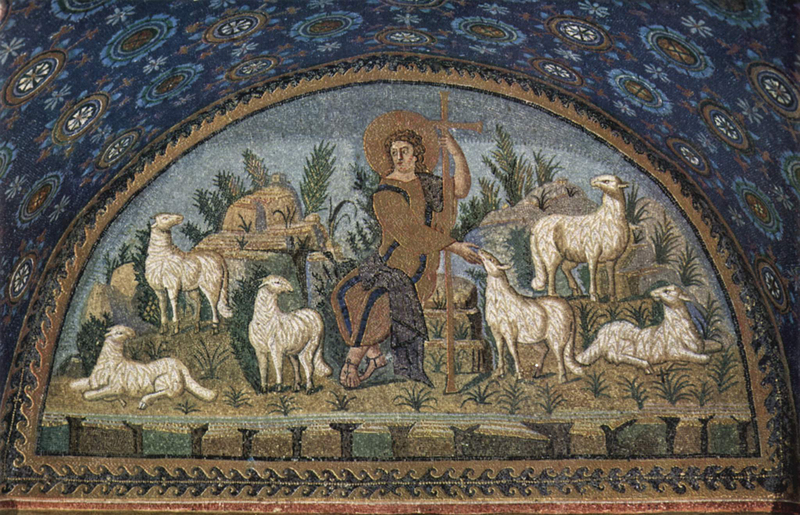 Tuesday, October 2: we will begin our seminar dedicated to the mosaics of San Vitale. Review the webpage dedicated to San Vitale. Remember that a week after the completion of the seminar you are expected to turn in a 3-5 page paper dedicated to an aspect of this seminar. Finish chapter 2 and read chapter 3 of Stokstad. Tuesday, October 9: We will complete our San Vitale seminar. I want to extend our discussion of San Vitale by looking at a series of Icons from the sixth century. Review the following web-page in preparation for the beginning of our discussion of Hiberno-Saxon art: Sutton Ship Burial. Tuesday, October 16: San Vitale Papers are due. Continuing our examination of the Hiberno-Saxon art, review the following webpages. Hiberno-Saxon Art. Chi Rho Page from the Book of Kells. One of the major monuments we will be considering is the Lindisfarne Gospels in the British Library. Examine the manuscript by following the link from the Turning the Pages site. Read Stokstad, 2nd edition, pp. 75-100 with special emphasis on pp. 89-100. Tuesday, October 23: we will begin an examination of the Carolingian Renaissance by considering the Imperial Ideal created by the Carolingians. We will examine the important relationships to Roman models. Review the page entitled The Carolingian Empire and the pages linked to this. Pay special attention to the page including an excerpt from Einhard's biography of Charlemagne. Read the primary texts included on the page entitled Carolingian Culture. Also study the page dedicated the origins of the Carolingian scripts. Review page dedicated to the Lorsch Gospels. Also read Stokstad, pp. 101-126. Consider also the webpage entitled Medieval Images of Power. Tuesday, October 30: We will begin an examination of Romanesque Art. Read Stokstad, 1st ed. pp. 219-264. Focus on the discussions of Romanesque architecture. Review material on page entitled Divine Ordo. Also review the images of churches included on the pages dedicated to the First Romanesque and Romanesque Architecture. We will also be examining the so-called Pilgrimage Route churches and understanding them in the context in the idea of Pilgrimage. Review page with excerpts from the Pilgrimage Guide. You are encouraged to review the webpages entitled Liturgical Objects and Relics. Make sure to follow the links on these pages. Pay particular attention to the poem entitled the Dream of the Rood. Tuesday, November 6: Make sure that you vote!! Your vote matters!! Review the webpage entitled: Coming Face to Face: the Romanesque Portal. Although these works focus on different subject matters, all of them have the common theme of Theophany or manifestation of divinity. These portals mark the divide between the profane space and the sacred space of the interior of the church, the earthly symbol for the Heavenly Jerusalem. Consider the Romanesque conception of Christ, and how you feel in relationship to these visions. Also review the webpage with an excerpt from St. Bernard's Apologia. Be aware that these pages are works in progress, and that I might be up-dating them in the next couple of days. Read the excerpts from Georges Duby's "The Threshold." Tuesday, November 13: Second Seminar: The Royal Portals of Chartres. Review the webpage I have constructed for the Royal Portals. See also Chartres Cathedral page.Read Stokstad, 1st edition, pp. 277-285. I will extend the deadline for submitting this second seminar paper until the end of the semester. I wanted to have the seminar before the Thanksgiving break so you have the option of doing the paper then. Remember that I am expecting a Third paper too. This one is a topic of your own choice, but you need to confirm your topic with me. Come talk to me about your ideas. Tuesday, December 4: we will complete our examination of Gothic Architecture by considering the French Royal chapel, Sainte Chapelle. We will then return to Gothic Sculpture. Tuesday, December 11: Final Meeting Time: all papers are due. Remember I am expecting three papers from each student: St. Vitale seminar, Chartres Royal Portals seminar, and topic of your own choice. The remainder of the meeting time we will watch the David Maccauley video entitled Cathedral.